Within secondary lymphoid tissues, stromal reticular cells support lymphocyte function, and targeting reticular cells is a potential strategy for controlling pathogenic lymphocytes in disease. However, the mechanisms that regulate reticular cell function are not well understood. Here we found that during an immune response in lymph nodes, dendritic cells (DCs) maintain reticular cell survival in multiple compartments. 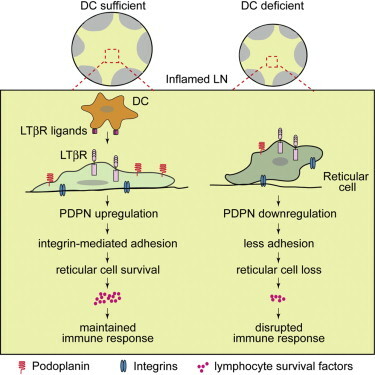 DC-derived lymphotoxin beta receptor (LTβR) ligands were critical mediators, and LTβR signaling on reticular cells mediated cell survival by modulating podoplanin (PDPN). PDPN modulated integrin-mediated cell adhesion, which maintained cell survival. This DC-stromal axis maintained lymphocyte survival and the ongoing immune response. Our findings provide insight into the functions of DCs, LTβR, and PDPN and delineate a DC-stromal axis that can potentially be targeted in autoimmune or lymphoproliferative diseases. Biological therapies for the management of immune mediated inflammatory diseases such as rheumatoid arthritis have proven to be extremely successful in recent years. Despite these successes, even the most effective of therapies do not lead to cure. Why chronic inflammation persists indefinitely within the rheumatoid synovium despite an absence of continuous stimulation, and why some patients with early synovitis progress to persistent disease whilst others do not, has remained unexplained. In contrast to the paradigm that stromal cells are biochemically active but immunologically passive, there is now growing evidence that stromal components from the rheumatoid synovium play a crucial part in the immunopathology of rheumatoid arthritis. Stromal cells play a central role in the transformation of an acute, resolving to a chronic inflammatory process, and to the persistence of synovial inflammation and joint destruction through a variety of immune mechanisms. Therapeutic manipulation of the stroma is a largely unexplored, yet potentially vital area of research. Targeting pathogenic stromal cells has the potential to provide a cure for chronic inflammatory disorders such as rheumatoid arthritis. In lymph nodes, fibroblastic reticular cells (FRCs) form a collagen-based reticular network that supports migratory dendritic cells (DCs) and T cells and transports lymph. A hallmark of FRCs is their propensity to contract collagen, yet this function is poorly understood. Here we demonstrate that podoplanin (PDPN) regulates actomyosin contractility in FRCs. Under resting conditions, when FRCs are unlikely to encounter mature DCs expressing the PDPN receptor CLEC-2, PDPN endowed FRCs with contractile function and exerted tension within the reticulum. Upon inflammation, CLEC-2 on mature DCs potently attenuated PDPN-mediated contractility, which resulted in FRC relaxation and reduced tissue stiffness. Disrupting PDPN function altered the homeostasis and spacing of FRCs and T cells, which resulted in an expanded reticular network and enhanced immunity. After immunogenic challenge, infiltrating and dividing lymphocytes markedly increase lymph node cellularity, leading to organ expansion. Here we report that the physical elasticity of lymph nodes is maintained in part by podoplanin (PDPN) signalling in stromal fibroblastic reticular cells (FRCs) and its modulation by CLEC-2 expressed on dendritic cells. We show in mouse cells that PDPN induces actomyosin contractility in FRCs via activation of RhoA/C and downstream Rho-associated protein kinase (ROCK). Engagement by CLEC-2 causes PDPN clustering and rapidly uncouples PDPN from RhoA/C activation, relaxing the actomyosin cytoskeleton and permitting FRC stretching. Notably, administration of CLEC-2 protein to immunized mice augments lymph node expansion. In contrast, lymph node expansion is significantly constrained in mice selectively lacking CLEC-2 expression in dendritic cells. Thus, the same dendritic cells that initiate immunity by presenting antigens to T lymphocytes also initiate remodelling of lymph nodes by delivering CLEC-2 to FRCs. CLEC-2 modulation of PDPN signalling permits FRC network stretching and allows for the rapid lymph node expansion—driven by lymphocyte influx and proliferation—that is the critical hallmark of adaptive immunity. Fibroblastic reticular cells (FRCs) are known to inhabit T cell–rich areas of lymphoid organs, where they function to facilitate interactions between T cells and dendritic cells. However, in vivo manipulation of FRCs has been limited by a dearth of genetic tools that target this lineage. Here, using a mouse model to conditionally ablate FRCs, we demonstrated their indispensable role in antiviral T cell responses. Unexpectedly, loss of FRCs also attenuated humoral immunity due to impaired B cell viability and follicular organization. Follicle-resident FRCs established a favorable niche for B lymphocytes via production of the cytokine BAFF. Thus, our study indicates that adaptive immunity requires an intact FRC network and identifies a subset of FRCs that control B cell homeostasis and follicle identity. Fibroblastic reticular cells (FRCs), through their expression of CC chemokine ligand (CCL)19 and CCL21, attract and retain T cells in lymph nodes (LNs), but whether this function applies to both resting and activated T cells has not been examined. Here we describe a model for conditionally depleting FRCs from LNs based on their expression of the diphtheria toxin receptor (DTR) directed by the gene encoding fibroblast activation protein-α (FAP). As expected, depleting FAP+ FRCs causes the loss of naïve T cells, B cells, and dendritic cells from LNs, and this loss decreases the magnitude of the B- and T-cell responses to a subsequent infection with influenza A virus. In contrast, depleting FAP+ FRCs during an ongoing influenza infection does not diminish the number or continued response of activated T and B cells in the draining LNs, despite still resulting in the loss of naïve T cells. Therefore, different rules govern the LN trafficking of resting and activated T cells; once a T cell is engaged in antigen-specific clonal expansion, its retention no longer depends on FRCs or their chemokines, CCL19 and CCL21. Our findings suggest that activated T cells remain in the LN because they down-regulate the expression of the sphingosine-1 phosphate receptor-1, which mediates the exit of lymphocytes from secondary lymphoid organs. Therefore, LN retention of naïve lymphocytes and the initiation of an immune response depend on FRCs, but is an FRC independent and possibly cell-autonomous response of activated T cells, which allows the magnitude of clonal expansion to determine LN egress. The poor clinical outcome in pancreatic ductal adenocarcinoma (PDA) is attributed to intrinsic chemoresistance and a growth-permissive tumor microenvironment. Conversion of quiescent to activated pancreatic stellate cells (PSCs) drives the severe stromal reaction that characterizes PDA. Here, we reveal that the vitamin D receptor (VDR) is expressed in stroma from human pancreatic tumors and that treatment with the VDR ligand calcipotriol markedly reduced markers of inflammation and fibrosis in pancreatitis and human tumor stroma. We show that VDR acts as a master transcriptional regulator of PSCs to reprise the quiescent state, resulting in induced stromal remodeling, increased intratumoral gemcitabine, reduced tumor volume, and a 57% increase in survival compared to chemotherapy alone. This work describes a molecular strategy through which transcriptional reprogramming of tumor stroma enables chemotherapeutic response and suggests vitamin D priming as an adjunct in PDA therapy.